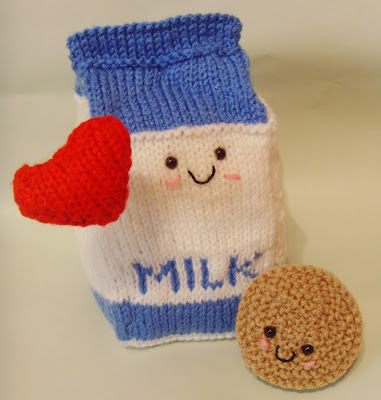 Free Milk & Cookie Toy Knitting Pattern by Raynor Gellatly. Ok apologies first off since it has been forever since I posted a pattern on this blog, I've had loads that I want to make into free patterns but being a bit of a procrastinator I never get around to it. Anyway this is one of my original patterns that I no longer have for sale and it's just sitting away looking lonely as there is nobody to make these little guys. And oh do you want to make these because the only two words to describe them are SUPA KAWAII!! The little heart in the picture was created using the mochi mochi land free heart pattern which you can find by clicking here. Whilst your there have a look at Anna's other patterns both for free and for sale because she is an amazingly talented designer, I love the randomness of her work. The milk also reminds me of milky the little carton from the Blur 'coffee and tv' music video, so if you know anyone who is a milky fan then knit one up for them. My usual copyright blurb still stands for these little fellows, i.e go forth and multiply them, even sell them but show the love and don't sell the pattern. So here's the pattern go and grab your needles and knit up the greatest love story ever told! For the following rows the stitches in black indicate where the white yarn should be used and the stitches in blue indicate where the blue yarn should be used. MilkThe black dotted lines in the diagram represent areas which should be folded. The following steps should be carried out with the right side facing towards you. Use whip stitch for all the steps apart from step 7 where mattress stitch is used. Sew together the areas indicated by the red dotted lines. With the black dotted edges folded inwards, pin together the top edge of the white coloums and sew together. The top of the toy should now be looking like a folded milk carton top. At this point you may like to add the facial features. Sew together the two row ends indicated by the red dotted lines using mattress stitch for invisible seaming. At this stage you may like to stuff the toy with polyester toy stuffing for a squishy effect or foam wadding so the finished toy has more structure. Join the bottom loop of one row and join it to the top loop of the corresponding row. Follow the diagram for direction. Unlike the diagram the seam must be pulled together as it is worked. Once the biscuit pieces have been seamed into circles, then attached facial features to one of the biscuit pieces. Take the filling row and sew together the row ends to make a hoop. Take the hoop and pin the cast on edge to the wrong side of the bottom biscuit piece. Sew the edges to the biscuit piece. Take the top biscuit piece with the face, top side up and pin it to the bind off edge of the filling hoop. Sew the edges of the filling to the biscuit piece. • If you wish the toy to be for a child under 3 years old or for a pet, I strongly recommend that you embroider on any features to reduce any choking hazard. • If you fill the whole milk with saftey stuffing the toy is very squishy and won't keep its shape for too long unless its only used for display, if you prefer it to have more ridity then filling it with blocks of foam may be better. • For a variation on the milk try knitting it in pink for strawberry milk, yellow for banana milk or brown for chocolate milk. Thanks for sharing the pattern! It´s super cute, I´m gonna knit it when the summer begins. ^_^ I love all of your pattern! hey Punky, all my patterns are knit on straight needles as i'm hopeless with dpn's and can't use them to save myself. however the pattern can be easily adapted to dpn's if you hate all the seaming. The milk and cookie pattern has to be knit on straight needles as it takes it shape by folding and seaming at the end. wow! the milk is such a good idea! I cant wait to give it a go, thanks for adding the pattern! Thanks for sharing your patterns!